What’s New for the Toyota 2015 Prius c? The Toyota Prius c has received a slight makeover for the 2015 model year. New features include restyled LED projector low- and high-beam headlights, restyled LED taillights, available LED foglights, a new grille, a reshaped front bumper, a sporty rear bumper, and a refreshed interior. Additionally, the Prius c gets some funky new color choices, like Tangerine Splash Pearl (orange) Sun Fusion (yellow), and Electric Lime Metallic (green). 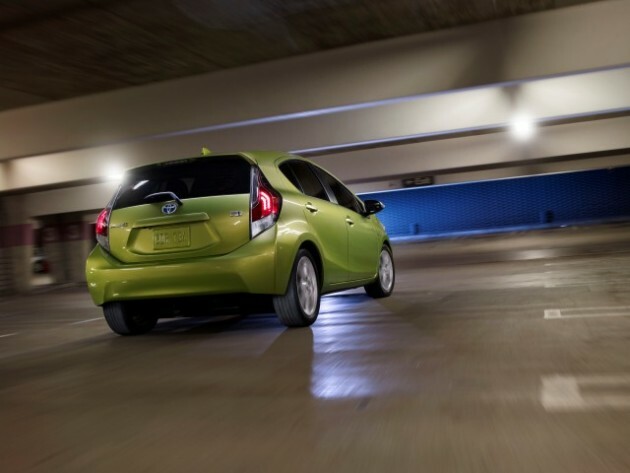 Unlike its larger siblings—the Prius and Prius v—the Prius c doesn’t immediately give off the aura of being a hybrid. In fact, at first glance you’d be forgiven for thinking that this was just another subcompact hatchback that’s offered in a wide array of bright colors. The 2015 Prius c not only looks good, it’s also designed smartly to allow for the highest fuel efficiency possible. A rear spoiler adds to the hatchback’s looks, while improving airflow dynamics. The bumps on the taillights aren’t just for show—they’re vortex generators that help improve the car’s straight-line control and efficiency by dictating air flow around the entire vehicle. 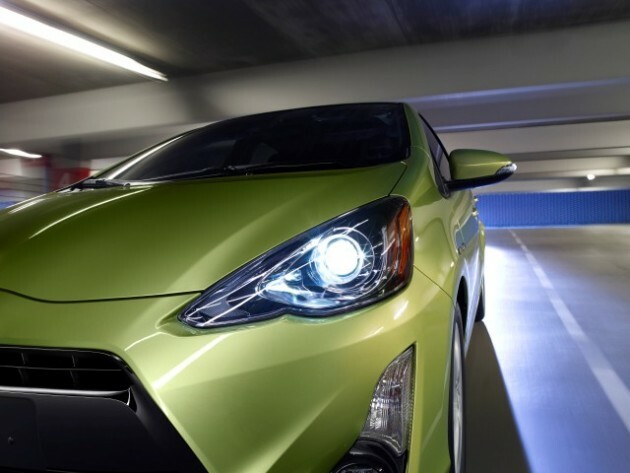 Each 2015 Prius c is outfitted with a 1.5-liter aluminum hybrid engine with EV and ECO modes. While it’s hardly the most powerful motor available—the Prius c offers just 99 horsepower—you’re hardly like to be interested in a subcompact hybrid if a more meaty engine is your type of thing. The 0.9 kilowatt-hour battery is located under the rear seat to allow for greater cargo room. Now we come to the really important stuff: the reason many people choose to buy hybrid vehicles. 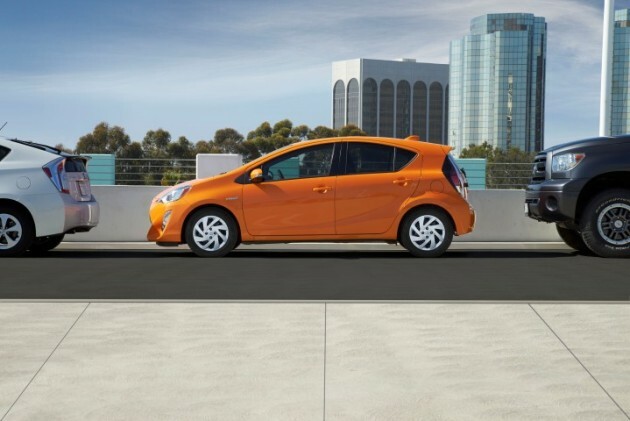 The 2015 Prius c comes with an ultra-efficient EPA rating of 53 mpg in the city and 46 mpg on the highway. That’s higher than your average Prius (or Prius v), and puts the Prius c among the most efficient city cars available. The Prius c’s EV mode allows the driver to keep the car in all-electric mode at low speeds for up to half a mile, making it perfect for start-stop city driving. The ECO mode, on the other hand, turns down the climate control settings and limits the car’s power output. This means the Prius c becomes more efficient—but also much slower. 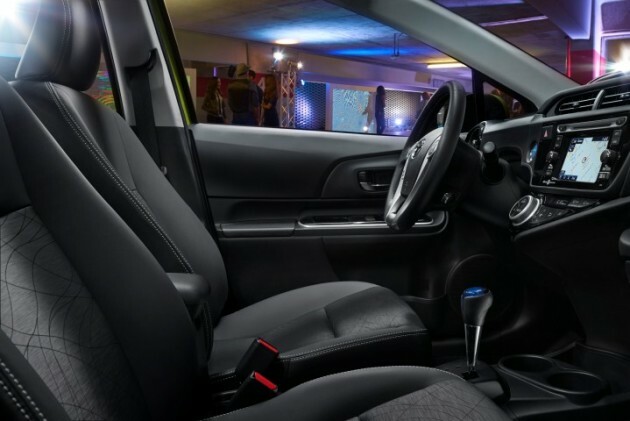 Inside, you’ll find the 2015 Prius c surprisingly spacious, thanks to its increased length when compared with other vehicles in the subcompact segment. The front seats are comfortable, made of either fabric of SofTex depending on which trim level you choose. Standard features include remote keyless entry; power windows; and Entune audio that includes Bluetooth, a USB port, and a 6.1-inch touchscreen. Options on higher trim levels include navigation, heated front seats, a backup camera, a moonroof, cruise control, and steering wheel-mounted controls. 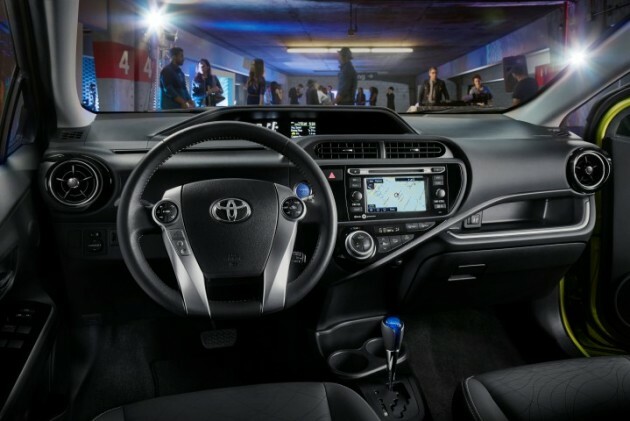 Just how fancy you want to get in your Prius c is up to you. Nine airbags are standard in every 2015 Prius c. In government crash testing, the National Highway Traffic Safety Administration (NHTSA) awarded the 2015 Prius c with four out of a possible five stars—not the safest vehicle on the road, but not bad for a car of its small stature. Similarly, the Insurance Institute for Highway Safety (IIHS) dropped its Top Safety Pick rating of the Prius c for 2015 due to its poor performance in the tricky small overlap frontal-crash test. However, the hatchback performed well in all other tests, scoring the highest possible rating of “Good” in moderate overlap, side, roof strength, and head restraints and seats testing.